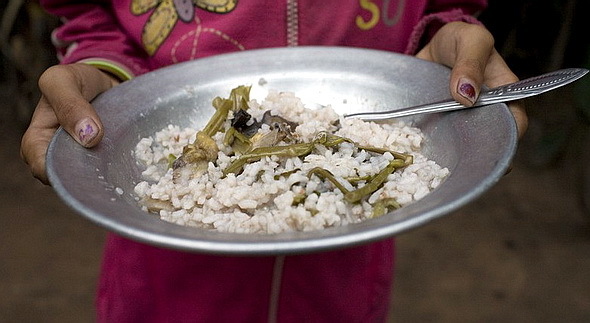 Nearly one billion people around the world suffer from food shortages. Among the causes of this situation is the improper use of farmland and the bottom line spells one five-letter word: greed. The shocking news that around one thousand million people do not have enough to eat. Furthermore, with over two billion people depending on smallholder farms across the developing world and with climate change bringing ever more serious conditions to vast swathes of the planet. Tthe prospect for the future is not only sombre, but also downright alarming. Natural phenomena are among the causes of this worsening situation, namely the earthquake in Haiti, the floods in Pakistan and the droughts in Sahel. However, the global collapse of the monetarist liberal economic model of capitalism has also played its part, affecting the most vulnerable, the tangible result being that more and more people experience the plight of hunger and malnutrition. Affecting the futures of the next generation of children who are eternally bound by the chains of endemic poverty and under-development. While the UNO does a lot of work behind the scenes, distributing food, calling for donations, promoting goodwill ambassadors to reach public opinion, the fact is that more and more people are going hungry in a world where freedom from hunger is a more and more elusive reality. Far more important than natural disasters is poor planning and policy and this affects millions of people, directly, and unnecessarily. Official Development Assistance to governments of food-deficient countries is nowhere near enough, from countries whose obese populations argue over who slams the next fast-food plastic pile of chemicals in the microwave before collapsing in front of a television set. Meanwhile hundreds of millions of children will lead unfulfilled lives, simply because they have not had access to nutritious food! If, as the UNO points out, agriculture is (obviously) the key towards defeating hunger, then how to explain the fact that much-needed arable lands are being used not to provide crops for the world’s hungry but instead a rapidly growing area is destined for the production of agrofuels? Coupled with this, and the other pressures referred to above, comes the practice of speculation with agricultural lands, selling them off for construction. While millions of dollars are spent on the administrative costs of maintaining the many agencies, NGOs, institutions, committees, councils and programs, corporate and private greed is making inroads daily, carving off lands which should be used for the production of food and desecrating it once and for all. What a pitiful comment on the collective lack of goodwill among Humankind, that at the beginning of the third millennium, not only is a growing number of people going hungry but the land needed for food sustainability in the future is becoming more and more scarce.